From the creator of Lazarus Gray and Gravedigger comes another hero of Sovereign City! Award Winning Author Barry Reese takes the fight against crime in Sovereign to the city’s very own streets in his very own Pro Se Single Shot Signature digital single two story series- The Adventures of the Dark Gentleman! Sovereign City has many champions but not all of them get the limelight. The Dark Gentleman is a crusader for justice, taking out the small fry criminals so that others can focus on the bigger picture. But for those whose lives are saved by the masked hero, he is just as important as Lazarus Gray or Doc Daye… He is the Dark Gentleman and he’s cleaning up Sovereign City, one petty thug at a time. That is if he survives the murderous secret of THE SILVER ROOM, the second and final adventure in THE ADVENTURES OF THE DARK GENTLEMAN by Barry Reese. A Pro Se Single Shots Signature Series from Pro Se Productions. 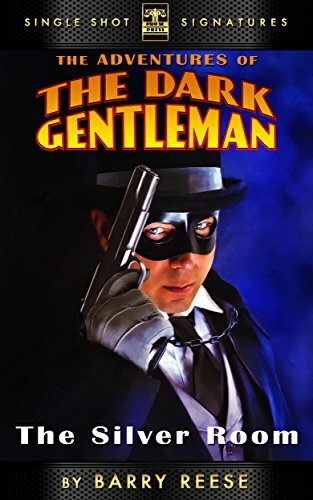 Featuring an excellent cover and logo design by Jeff Hayes and digital formatting by Antonino Lo Iacono and Marzia Marina, THE DARK GENTLEMAN: THE SILVER ROOM is available now at Amazon for only 99 cents at https://www.amazon.com/Adventures-Dark-Gentleman-Silver-Room-ebook/dp/B01NBYT4JC/ref=sr_1_1?ie=UTF8&qid=1491356269&sr=8-1&keywords=dark+gentleman+reese. It is also available for most digital platforms via Smashwords at https://www.smashwords.com/books/view/699715.